The shortest month packed the hardest punch, this year. That statement has its own limitations. We are talking only about the second month of the year. 2019 has yet to unveil itself completely, but it looks like it is vying for the title of the most unforgettable year already. Elections at the National level, weather weirding at the mountain level, colour work patterns at the work level, long distance daughters at the family level, and many an upheaval at the personal level. Weddings, special holidays and affectionate folks are being balanced by departures, grief and confusion. I began knitting this sweater, thinking it would be a breeze. Thick yarn, great stitch definition, well written and simple pattern..the odds were stacked on my side. I cast on the sleeves, announced it the world, and took an overnight train to have a delightful time at Dehradun. 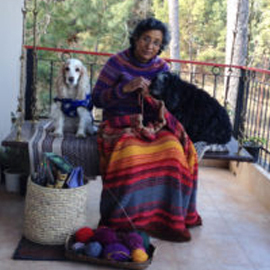 My friend, who has been a champion in pushing me to take this knitting venture forward, hosted me for the most pampered, affectionate time ever.. we did nothing special–no gourmet meals, no shopping trips, no sightseeing days, no incredible gifts to each other–but long chats, delicious home food, two adorable dogs and being together…It was all that the knitting and the knitter needed! It turned out to be the calm before the storm. Our family lost a dear son, brother, husband, father, ship builder, painter..all rolled into my brother-in-law. He took a few minutes to pass over to the other side, but left us bereft for all time. Through the waves of grief, the rituals of bereavement and consoling each other, the days of empty darkness, I knitted when the house was quiet. A week with my sister, and her resolve to accept the grief of loosing her partner, gratitude that he went so quickly and painlessly, determination to keep breathing and moving…I could process all my emotions while knitting. It helped me to be there, in whatever way I could be. I have almost completed the cardigan..my solitary project of Banging out a Cardigan, left me battered emotionally but showed me how knitting can help me cope and help me come to terms with the ups and downs of life. The band and buttons are still to be added…and here comes my dilemma. Do I knit the button band after blocking the sweater? According to the designer, blocking will give an accurate idea of the final length of the garment. My thoughts about this? Wouldn’t the button band expand when I wash the cardigan next time?! February…for Banging out a Cardigan. Very well written blog. Very sorry for your brother in law. Thank you Ritu Nayyar. With every passing day I realise how much writing means to me. Putting down my emotions in words helps to clear the mind, slot feelings into their appropriate places, and get a reason to move on.